Engineer Olaf Berg became manager of Burmeister & Wain’s Paris office in 1908. The office was in charge of marketing and sales of B&W’s centrifuges for homogenizing and pasteurizing milk. A technology invented 50 years earlier. Sales was not going well. During his stay in Paris, Berg had the opportunity to visit the aerodrome at Issy-les-Moulineaux, where he witnessed the flights of Henry Farman, Louis Bleriot and Leon Levasseur. What made Berg think about aeroplane production in Denmark was the slow sales of centrifuges, and the impressive results of the Wright brothers, which he saw, during their visit to France during 1908. Wilbur’s flights created quite a stir in the aeronautics community, because of the ease of banking their arcraft. Instead of making large turns, the Wright flyer could turn on a dime. Wilbur’s flights in Hunaudieres in August 1908, introduced the “Gauchissement” (Wing warping) control system to the French flyers. 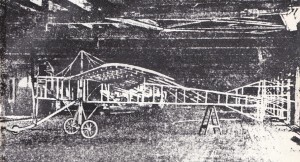 During a short visit back in Denmark, Berg discussed what he had seen with engineer Louis Storm, and they both agreed to start an aircraft production. The main purpose was to demonstrate that aeroplane production was feasible in Denmark, and first and foremost to build a workable aeroplane. B&W’s director Dessau was not entirely convinced, but he allowed the two gentlemen to use the facilities at B&W for their aeroplane venture. The news leaked, and the press soon brought articles about the aeroplane. 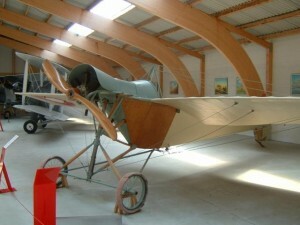 Berg & Storm chose the Bleriot XI as a model for their aeroplane, but used the landing gear of the Antoinette monoplane constructed by Leon Levasseur. Bleriot had just crossed the english channel in a Bleriot XI, and Hubert Latham had performed incredible stunts at the airshow at Blackpool. The fuselage was constructed during October 1909 from Oregon-Pine, Ash and plywood. The model-makers at B&W did the carpentry. The wings, as well as elevators and rudders were covered with balloon-fabric (silk covered in rubber). The silk was attached to the wing by clamping it to the wings using wooden stringers on the outside of the wing. The wings were using standard ailerons. The metal work was constructed by the centrifuge department at B&W. The engine was a 3-cylinder Anzani, identical to the engine used by Bleriot during his channel crossing. It was able to deliver 30 BHP at 1600 r.p.m. The speed of the engine was very difficult to control. It was either full speed or nothing. The machine was rigged by Niels Petersen, the machine-shop foreman. He had a keen interest in motor-cars, and his experience with fast engines, made him ideal for the Berg & Storm project. 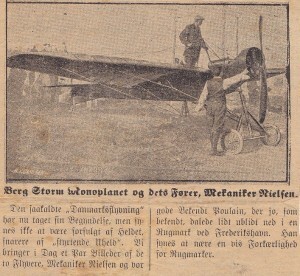 The aircraft was ready by February 1910, and it was transported to Kløvermarken aerodrome, outside of Copenhagen. The first flight was performed by Knud Thorup, a vine-merchant from Aarhus that had taken flying lessons in France the year before. The controls were arranged as follows: Rudder by foot pedals, elevator by pulling the joystick backwards and forwards, and wing-warping by twisting a wheel mounted vertically on the stick. This control methods, “DEP-control”, named after its inventor Deperdusin is still in use today. The initial use of ailerons, as was popular with French aviators, proved hard to control on the Berg & Storm I, and the wing hit the ground during the first take-off attempts. The “Gauchissement” system was quickly adopted. The Berg & Storm I flew for the firs time on the 4. Juli 1910 at 20:30. The wing incidence was 6 degrees, but it should probably have been 12, resulting in the aircraft flying nose-down, with the propeller having 6 degrees of down-thrust. Engineer Berg was extremely excited, and a young lady handed Thorup a rose as a toke of her appreciation. Flights followed almost daily, including many with a new engine designed by Niels Petersen, until Septembed 1910, where the plane crashed with the unexperienced Berg at the controls. The Berg & Storm II aeroplane was a new construction. The fuselage was triangular in cross-section, something copied from the Antoinette aeroplane. The wing-profile was identical to that used on the Berg & Storm I. The fuselage was much slimmer than the B&S I fuselage, and constructed entirely out of wood and covered in plywood. The triangular shape made control difficult. All controls were arranged on the stearing column, with the exception of the control for the engine oil, that was controlled by a foot-pedal. The Berg & Storm II was constructed at a new hangar at Kløvermarken, bought by Berg & Storm during 1910. The hangar had the letters “B&S” written in large black lettering over the hangar doors. Storm got a job in Norway during 1911 and it was Berg and Niels Petersen that finished the B&S II. The new machine was ready by April 1911. The first flight was by Niels Petersen, that “just” had to learn how to fly first. He got his certificate on the B&S II, after about two months of training. The aeroplane proved a good flyer and Niels Petersen made several figure-8 flights and several landings. Berg was now confident that they had a solid product, and he planned a large tour during 1911 – the so called “Danmarksflyvning” (Denmark-Flight). The trip would start at Skagen, and they would then perform all the way down throught Jylland, across Fyn ending back in Copenhagen. Many records were broken on this trip, including height-records (500 meter) and duration (27 minutes), both from Sohngaardsholm Castle in Aalborg. The 27 minute record flight would also be the last Berg & Storm II flight, as Peter Nielsen ran out of fuel and had to crash-land outside the airstrip at Sohngaardsholm parklands. A new aircraft, the Berg & Storm III was soon ready. It was similar to the Berg & Storm II, but it was designed as a trainer, and had two seats in tandem. The new aeroplane had the same wing-span as the Berg & Storm II, but it had a different airfoil – the “Eiffel 14”. The wing area had been reduced to 14.5 sq. m. resulting in a much faster landing speed, and a more difficult take-off. The student was supposed to sit behind the pilot and watch his movements during flight, but the engine was still a Peter Nielsen 50 HP engine, and take-off proved difficult when a passenger was onboard. The Berg & Storm III took flight during December 1911. The aeroplane was immediately sold to General Grut, who established a flying school for army personel from December 1911, with Peter Nielsen as instructor, until 1912, where General Grut donated the aeroplane to the Army. This was to be the beginning of the Army Flying School, which was located on Kløvermarken, just outside Copenhagen. The Berg & Storm III was decomissioned two years later, in 1914. The aircraft today resided in Danmarks Flymuseum in Stauning, Danmark. Thank you a lot for very interesting and informative story! This story needs the name Peter Nielsen changed to Niels Petersen where it appears. Does anyone know of Niels Petersens’ other activities and who he was? His full name? D.o.b. I know he raced a Jurgensen motorcycle in the French Coupe Internationale in 1904. Produced his own pacing Motorcycle and V twin engine in 1907 called DANICA (Latin for Denmark). What projects did he partake after 1912?